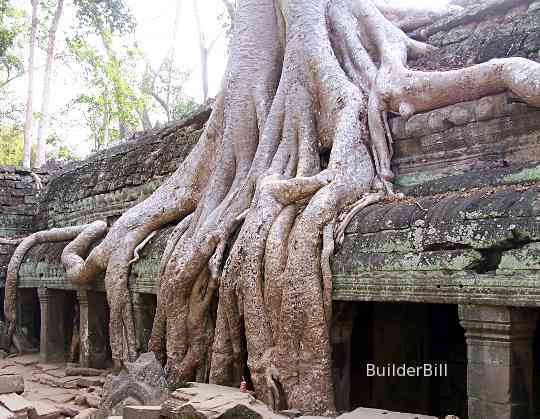 A giant rainforest hardwood tree, a Bombax at Ta Prom temple in Cambodia. I am indebted to the folks at Wikipedia for the above paragraph and I use it simply as an illustration that even a list as the one here (also from Wikipedia) is by no means complete, It seem that one would have to write a very large book to list them all and their various local names. Yellow birch (B. alleghaniensis syn Betula lutea) - most common birch wood sold in N.Am. Carapa (or Andiroba, Carap, Crappo, Crabwood and Santa Maria) (Carapa guianensis) . Bangkirai, also known as Balau. Ipe also known as Brazilian Walnut. Brazilian walnut; Not a walnut see Ipe above.